On Saturday I posted an overview of The Keys of Heraka-at, breaking out the various areas of the adventure. Now it’s time to start working toward more detailed development. I’m not ready yet, but considering that each of the areas of the adventure site could be small maps and are at a bunch of different elevations it is tempting to try my hand at isometric mapping when I get that far. At this point I’m going to expand on the ideas I had yesterday and start exploring how they fit together. I won’t have all the mechanical information yet, but I can expand on what I do have so I know what mechanical information I need. I’m making some changes to the original map (shown below) that increase some of the interconnectivity. Not all will be obvious (especially since I’m adding extra), but they will be there. There are some potential residents identified, and several of them could be reasonable random encounters. There are also likely to be safeguards against vandalism, the entire place was set up to protect knowledge until it can be used (and the Last Donnerkonig may be able to do something to trigger defenses as well). For the most part I think I’ll roll with random encounters. Many areas are exposed to the outside, after all. The Aerie is located high in the outcropping and is full of nooks and crannies suitable as nesting areas. The floor is crusted with guano. The Interior Stairway is fairly easy to find, as is the route to Lightning Peak, since those are where most of the fresh air blows in (pushing stench toward the Library). In particularly windy conditions the Aerie can have airborne particles of guano that can sting the eyes. I’m going to change this a bit. I removed the link directly from the Aerie to Lightning Peak. The primary major wind flow is in via the Interior Stairway and out via the windows accessible via Pinnacle Base. Those windows could be kind of unpleasant. I’m reasonably certain the architect would not have wanted too much debris blown toward the library, so I think I’ll add some mechanism to limit this. A set of baffles to break the airflow, or some rooms that can act something like airlocks perhaps. Encounters: Something avian, no question, nesting around the aerie. I think something intelligent (aarakocra? something else?) 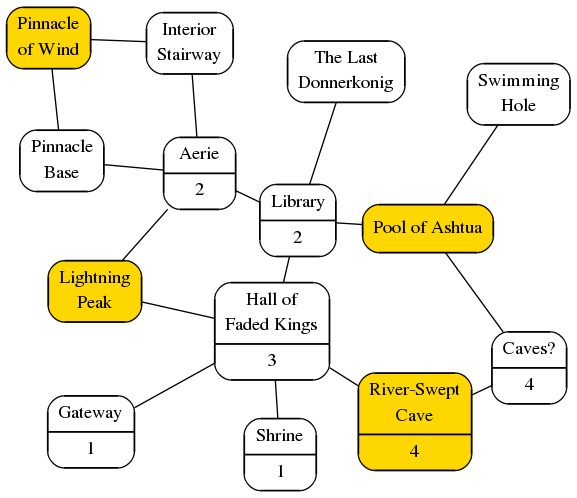 that may not have examined-for-understanding everywhere, but have at least looked into those areas accessible from the air (Pinnacle of the Wind, Lightning Peak, the Shrine, and the Hall of Faded Kings. Being outdoors and low down, may not be interested in the Pinnacle Base and the Gateway, and I think wary of the Interior Stairway because of the wind and the inhabitants. A small cave complex between the Pool of Aeshtua and the River-Swept Cave. I don’t know what’s here, but I suspect it’s not really related to the primary adventure. The entrance on one or both sides is probably kind of hard to get at (cracks or small eroded tunnel high on the wall in the darkness?). There are four sub elements here, so despite being a two-edge node I feel like this deserves to be a hard-won location. Almost certainly an alternate path in or out (sinkhole or similar from the outside?). Small cave complex, perhaps a handful of ‘rooms’. Encounters: I think a very small tribe or family group of wet-ground-friendly humanoids, with some knowledge of Aeshtua. Might also range into the Pool of Aeshtua, the River-Swept Cave, and the Swimming Hole. This is the primary expected entrance to the outcrop. Forecourt in front of large stone doors, entrance area leading to Hall of Faded Kings, and so on. TODO: Expand on detail, obviously. Physically located between the Pinnacle of the Wind and Lightning Peak (one to the left and one to the right). Lightning can be seen to periodically strike Lightning Peak, and a strangely regular structure can be seen at the top of the Pinnacle of the Wind, something like a crown. Similarly, the Pinnacle Base should be on “the Gateway side” of the Pinnacle of the Wind and offer an alternative route up and in. This is not reflected in the graph below very well. The Gateway should perhaps be fairly ominous. I’m thinking heavy stone, inset with storm metal (is it charged with lightning? Especially with lightning striking the Peak above? 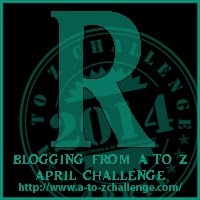 ), or possibly ajar with ozone-smelling air blowing out. Might be actually safe, but intimidating. Encounters: the gateway might be dangerous, there could be wild creatures or the like. I don’t know that anything would be living here, though. This great hall is lined with paintings and frescoes showing great acts of the Donnerkonig over the centuries they ruled, from the mighty acts that established their power, through acts during their reign, and even the diminishing acts during their decline. The Great Hall of Faded Kings is fairly high within the outcrop. During the day, light is admitted through holes high in the wall that face outside. These holes are mostly about four or five feet across and open to the weather, but the artwork is sheltered from direct effect — weathered and worn, but still can be seen and understood. There are exits near critical images that can ultimately lead to the special location for each treasure, plus others. Each of the treasures is to be highlighted, along with an indication of their abilities. There are probably indications of the related Donnerkonig Palaces, and perhaps hints of their origin (which is more or less where they can be found now), but the primary purpose is to reveal their identity. A gentle breeze carrying the faint odor of distant guano can be felt coming from ‘F’. Lose the guano odor, the changes to the Aerie should reduce this enough to make it no longer notable. Replace the paintings and frescoes with mosaics. They are more durable, and I think may carry a different feel. It would be easy to treat the Hall of Faded Kings as a single large chamber, but I think separating into five major areas might work better. Gateway opens into the central area, where the floor has a large mosaic of the sign of the Donnerkonig (I think greatly worn and obscured, as the Donnerkonig themselves; the Donnerkonig returning may restore this mosaic itself). From this central chamber are four others, each with mosaics alluding to stories of one of the Donnerkonig treasures. The chambers alluding to the Trident of Lightning and the Crown of Rain provide routes to Lightning Peak and the River-Swept Cave respectively. 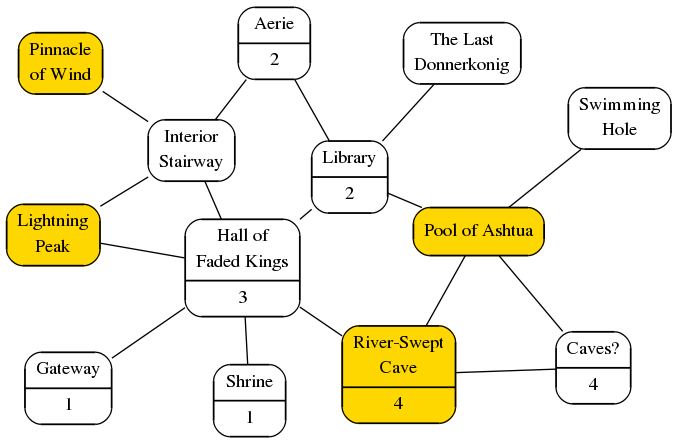 The chamber alluding to the Ring of Waves provides a route to the library (which is near the Pool of Ashtua), possibly with reference to Aeshtua (as a scholar? ), and I think the chamber alluding to the Horn of Gales leads to the Interior Stairway and indicates a climbing journey to find information about the Horn (and includes an image that looks like the Pinnacle of the Wind). Encounters: look over Doom Paintings from Raging Swan for the mosaics. Perhaps encounters could be triggered by tampering with things. A spiral staircase climbs the inside of the Pinnacle of the Wind. This is quite a breezy passage, with wind generally blowing down from the top of the Pinnacle down to the Aerie. Exposed flames are likely to be blown out, even lanterns stand a chance of blowing out in the gusty wind. Reading (such as scrolls or books) is likely to be difficult. The stairs have no railing but are sound, but also sort of narrow (single file). There are windows enough to provide enough light to navigate, at least during daylight hours, but they are small and generally located away from the stairs. Walls may have carvings and the like providing information. Or may not. I’m making this a travel hub. In addition to the climb up to the Pinnacle of Wind, I think there may be niches or rooms off landings. I am enlarging the windows and moving them so that coming in doesn’t require a drop to a narrow stairway, and adding a link directly from the Hall of Faded Kings. I think I won’t have information on the walls on the climb up, this is mostly a travel route with points of interest along the way. Adding a route to Lightning Peak (secret passage from one of the rooms off the Stairway, I think). Encounters: wind mephits or the like? Small air elemental creatures? Air-based fey creatures that like causing mischief (which makes the aarakocra wary but not fearful of them)? Still windy in the main climb. This is the crypt of the last Donnerkonig, the Betrayer. His ghost can often be found here, to be laid to rest by the return of the Donnerkonig. He is willing to speak with those who approach him peacefully, providing some guidance and suggestions to consider carefully the information they find in The Keys of Hereka-at (treat something like speak with dead — he wants those who follow to succeed, but they must do so on their own merits, he cannot direct them). TODO: Not sure how I want this to go. I’m thinking advisor rather than director. The information needed should be available via the other locations in this adventure. May be a GM-saver if something is missed. Not much to say here yet, it’s basically down to mechanics. I’m pretty sure I want something special about his sarcophagus, but I don’t know what yet. Encounters: ghost, obviously. Look up Sarcophagi from Raging Swan. This was originally intended to be a library, but over time the elements have largely had their way with the exposed written materials. Fragmentary references to history and events of the time of the Donnerkonig may be found here. These are often somewhat contradictory, or at least presenting a differing interpretation, of common knowledge. Should identify ‘knowledge locations’ in the Shrouded Fen. TODO: The subelements may be secured and better-sheltered references. I don’t know their nature yet. TODO: The path to The Last Donnerkonig’s crypt should probably be hidden, it’s discovery a reward of clever play (or bloody-minded determination, knowing my players). Not much to add here yet. Should outline contents and key discoveries (search to find?). Encounters: Some hazards, traps, or paper-loving monsters here? The top of the outcrop hosts a recessed stony area. Where the Pinnacle of the Wind has obelisks sand is open to the wind, the top of the outcrop is a storm-blasted barren. The Pinnacle has runes carved in the obelisks, Lightning Peak has only the jagged image of a trident, the tines point directly to Storm Mountain in the distance. Storm Mountain is where the Trident of Lightning is to be found. TODO: Really simple area, should I look to complicate things? Lightning prone in stormy times, windy without cover at others (near the edge, might be prone to be blown off?). Lightning Peak should probably be the highest point on the outcrop, in order for it to be the primary impact point of the lightning. It occurs to me, though, that if there is storm metal here there could be greater attraction for lightning. If I do this I can both allow the Peak to be lower than the Pinnacle (which is useful, you can look up from the Peak to see the obelisks on the Pinnacle, and down from the Pinnacle to see that there is something down at the Peak. It could be somewhat evident from the height and proximity to the rooms of the Interior Stairway that an inobvious route may be available. There are at least two locations here. One is obviously the guidepoint (jaggy trident shape blasted into the surface, lined with storm metal and pointing toward Storm Mountain), another is where the primary routes up come to the surface. There may be lightning-runes (jaggy runes lined with storm metal) also blasted into the surface to help draw the lightning — and well-charged, messing with them could be very hazardous. There may be a location or two shortly below to top (where the secret passage from the Interior Stairway enters). Perhaps the individual lightning-runes can be used to learn (directly, or via research) lightning-related magic. Encounters: probably nothing specific, depending more on hazards. The base of the Pinnacle of Wind is anchored to the stone of the outcrop. It is possible, but perhaps difficult, to climb to the top of the Pinnacle, but partway up are ‘windows’ similar to those in the Great Hall that become evident and accessible, and provide exterior access to the Aerie. There is a short drop (ten feet?) to the floor, but even so it may be easier than continuing up the outside of the Pinnacle. TODO: feels like it needs something dangerous or informative. Removing. It doesn’t particularly add anything. Instead I think I’ll simply identify the areas accessible by climbing (Interior Stairway and Aerie, fairly easy climb; Pinnacle of the Wind, difficult climb; Lightning Peak, very difficult; Shrine probably easy, but you need to know it’s there, likewise any land-based access the Caves. A tall spire of stone, growing from the side of the outcrop, the top is covered with obelisks carved with runes describing two routes to the Pillars of the Sky, location of the Horn of Gales. One route involves going to the Spire of the Bronze Sorceress (whose help may be enlisted), the other is through the Grey Canyon (which has changed since this location was prepared — must remember to describe clearly, and how the Canyon clearly does not match, so players can realize something’s not right). The pinnacle is a difficult climb from the Pinnacle Base, but it can be done. Easier would be to go up the inside via the Interior Stairway. As with Lightning Peak, probably some rooms immediately below the top, before stepping out. Outside the ring of obelisks is very narrow and uneven, bad place to fight. Most writing should be on the inside, but the brave deserve reward, there may be something on the outside. Can see down to the Gateway and to Lightning Peak. Obelisks should be heavy enough to be functionally immovable, but if I want a hazard there may be some weaker, lighter, or poorly-balanced. If so, make it obvious. Encounters: random, but there may be residents of a sort. This 15-foot wide pool of fresh water is formed of the carved coils of an immense stone serpent, with the head and ‘upper’ body looming above it. When a suitable offering is made [hinted at in a picture in the Hall of Faded Kings, fairly easily known to those with religious or local knowledge] the eyes will brighten and Aeshtua’s voice can be heard, providing directions to her grotto and the Ring of Waves. Aeshtua is here in spirit, theft of her offerings without need will be noticed and remembered. Offerings sink to the bottom of the 20-foot deep pool, and 15 feet below the surface of the pool a short underwater tunnel leads to the Swimming Hole. There is some slight turbulence to the water as the water outside flows past and refreshes the water here, but it does not particularly hinder swimming. The Pool of Aeshtua is in a cave low in the complex, close to normal ground level. This pool is found in a more or less natural cave. The route to the Caves should be hard to find (count as secret or concealed door? ), as are the underwater tunnels (add one to the River-Swept Cave). All are actually not that hard to find if you look in the right places, though they should probably be uncomfortably tight. Encounters: primarily the statue of Aeshtua, but the residents of the Caves are probably common here, and there may be something dangerous in the water (but probably not, if under the protection of Aeshtua). The river has undercut part of the outcrop and exposed an eroded limestone cave. The cave — or the outside, depending where you start — can be reached by diving down about five feet below the outer shell of the outcrop. There is also a narrow crack that allows light in, but this is hard to reach from the river because of the current. It is, however, wide enough to admit a climber or swimmer (having no ‘floor’ to stand on). This cave is reminiscent of the Sea-Swept Vault containing the Crown of Rain, and the stalagmites are, upon examination (local knowledge, geography) a serviceable map. The outcrop and the location of the Sea-Swept Vault are both marked. Clearly the River-Swept Cave must be low in the outcrop, to be near the water. TODO: what kind of marking makes sense here? how might the PCs recognize the ‘map’ for what it is? Perhaps it is more evident when viewed from the ‘dry side’, coming from the Hall of Faded Kings? TODO: I really should research these caves better, this doesn’t seem quite right to me. For now, go with GreyKnight’s suggestion. The location of the outcrop is marked by a cut aquamarine embedded in the rock with a silver surround. The Sea-swept Vault is marked by a similar, larger, aquamarine with a more elaborate silver border. The symbol of the Rain is present on this one. A delicate line of silver marks out a route between them, and certain stalagmites are inlaid with patterns of silver rings (landmarks). The metal highlighting the map will reflect light carried in and draw attention, which should cause explorers to examine more closely. Perhaps use as a fallback, including markers for the other treasures, or (depending on space used) showing the broader journeys required (where the treasures need to go). TODO: identify stones or metals for the various items? The Trident of Lightning is going to be storm metal and probably amber, obviously, the Crown of Rain is evidently silver and aquamarine. Find options for the Horn of Gales (bronze and something?) and the Ring of Waves (brass and something?). A long-unused but still-consecrated shrine to the gods of the Heraka-at and the Donnerkonig. TODO: I have no detail about what this looks like yet, but presumably has much to do with storms and the sea. The Shrine is a circular chamber entered from the far end of the Hall of Faded Kings. It has no roof and is completely open to the elements. At equal intervals around the walls are embedded bronze icons of the symbols of Lightning, Rain, Wind, and Waves. In the centre of the room is a cubic altar carved from granite, with bronze upper detail. At each corner of the altar is an elegantly-formed lampstand (long extinguished). The lampstands are magical: once lit, they cannot be put out by weather conditions or immersion in water. They can be snuffed deliberately. Those lampstands are entirely likely to be stolen. They’re basically only everburning torches, but around here they will be no end of useful. Perhaps instead, as long as they are part of the shrine they can impart their resistance to wind and water to torches and other fire-based light sources lit from them. I think something like that would be a good idea. This might be a common feature of such shrines, lampstands that can impart everburning qualities on fire-based light sources. A small river passing the outcrop has something of a pool here, sheltered by some stone jutting into the river. The water cycles here, enough to freshen the water in the Pool of Aeshtua (accessible by a short underwater tunnel). Some small treasures, offerings to Aeshtua that were swept out by chance (or rejected by Aeshtua) rest among the sand and stone at the bottom of this pool. Nothing really to add at this point. I may end up removing this one, to be honest. As with the Pinnacle Base it might be sufficient to identify that there is a route in and out underwater via the Pool of Aeshtua and the River-Swept Cave, and leave it at that. This is getting big enough that I think I’ll have to split it into separate posts for each location soon. I’m getting a better feel for it, though. The obvious choices for the Ring of Waves would be pearl or coral, but I might suggest chrysoberyl. Specifically green and slightly yellowish green chrysoberyl. For the Horn of Gales: Check out the blues and greys you can get with topaz, I think that might give you the right kind of feel. You could even make a spread part of the theme, (bright sky blue at one end, a stormy grey at the other), signifying how the winds both bring and disperse storms. Or, as Frendle shows, abalone (or other mother of pearl). I’ll look around a bit more. For some reason opal comes to mind for the Horn. A very wave like brass ring. Wow, that does look pretty cool. Thanks Frendle. Pingback: Tales of the Donnerkonig | Keith Davies — In My Campaign - Keith's thoughts on RPG design and play. Pingback: Unusual Rewards in the Sandbox | Keith Davies — In My Campaign - Keith's thoughts on RPG design and play.